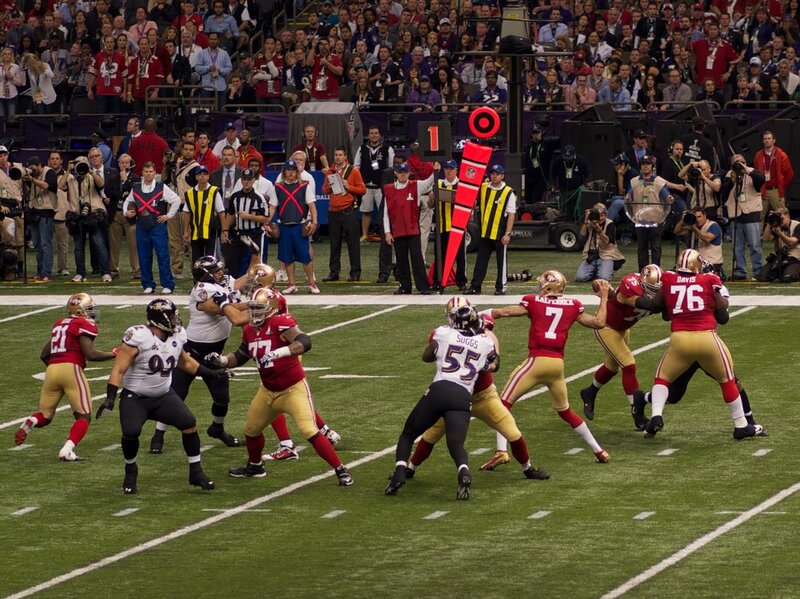 Colin Kaepernick (number 7) is set to throw a pass in Super Bowl XLVIII on Feb. 3, 2013. “New England Patriots legend Tom Brady will be playing in his record ninth Super Bowl on Sunday, while the Los Angeles Rams’ 24-year-old signal-caller, Jared Goff, will be playing in his first. But no quarterback looms over the NFL like one who has not set foot on an NFL field since the 2016 season — former San Francisco 49er Colin Kaepernick,” Michael A. Fletcher writes on ESPN’s The Undefeated. I don’t know if that’s as true for the fans as it is for the media, which I think tend to be more liberal. (Eighty six percent of black fans support Kaepernick but only 36 percent of white fans do., Fletcher writes, although the majority of both groups believe he has been penalized for his views.) I myself, a white woman, am a Kaep fan. I think the NFL blackballed him for his kneeling Black Lives Matter protests and I hope he wins his grievance suit against the league. Having said all that, I’m of two minds about denouncing Gladys Knight and Maroon 5 for taking part in Sunday’s Super Bowl between the New England Patriots and Los Angeles Rams. On the one hand, participation can be viewed as tacit approval of the NFL’s treatment of Kaep. That’s why Rihanna, Jay-Z, Amy Schumer and Cardi B aren’t participating. And that’s why I was so passionate in my criticism of Novak Djokovic and Rafael Nadal for thinking of playing an exhibition in Saudi Arabia after its involvement in the murder of dissident journalist Jamal Khashoggi was announced. But freedom of speech and action doesn’t just apply to those whom we agree with. Knight and Maroon 5 are not engaged in hate speech here. And the NFL hasn’t murdered anyone — although the league has to pay out hundreds of millions of dollars in the concussion-related dementia and deaths of some former players. But that’s not what Kaepernick’s protest is about. His protest is about people of color who have been abused and murdered by the system. Maybe that’s worth a Super Bowl boycott. Or maybe the best way to show solidarity with Kaepernick is to let others exercise the rights for which he has paid so high a price.